Picture the scene: You walk into a coffee shop and order a cappuccino. The young man behind the counter hands you a drink and wishes you a pleasant day with a Colgate smile. Suddenly his expression drops, his face turns stiff, there's a muted bang and some smoke emerges from his nose. He crashes to the ground in an almighty rigid clunk. Could this be the fate of some poor future android? 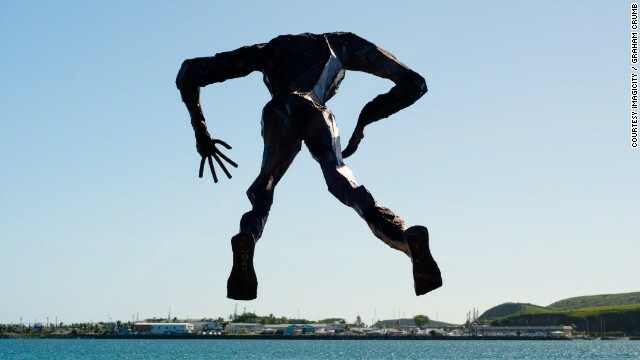 Will malfunction one day be the only means of telling human and robot apart? 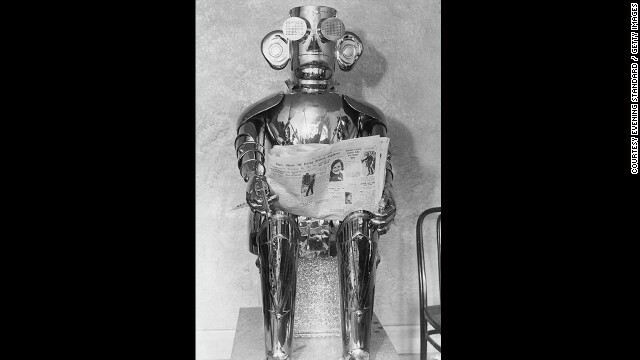 Here, CNN takes you through the evolution of the robot: from literary fancy to paranoid androids with artificial brains and emotional baggage. It turns out man has feared robots rebellion since the word robot was coined. 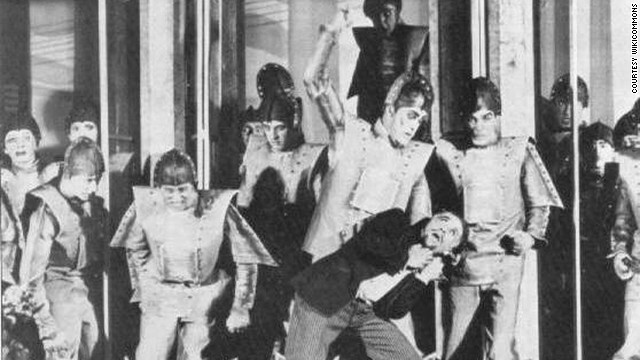 It was Czech playwright Karel Čapek in his 1920 play "Rossum's Universal Robots" ("R.U.R.") that the term was coined to describe his factory-made people who, in his play, went from serving humans ("robota" is Czech for forced labor) to revolting and rendering them extinct. 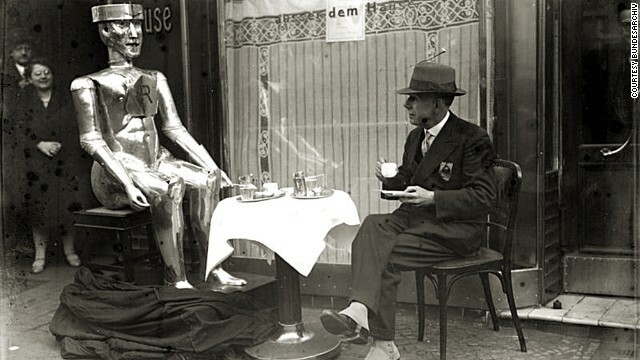 Even British robots have afternoon tea, don't you know? 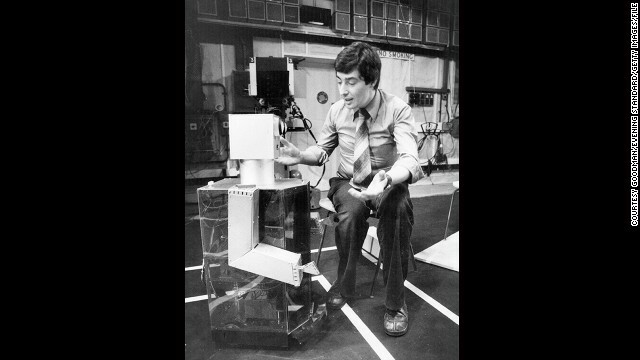 Eric -- the first British robot ever to exist -- seemed to believe he had an example to set. The invention of the Englishman Captain W.H. Richards, Eric was able to turn his head and take a bow. Presumably Eric v2.0 loved to queue and always said please, thank you and sorry. 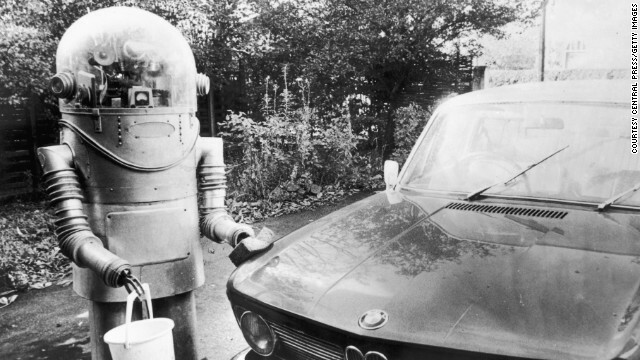 After 14 years and thousands of dollars, the young British scientist Harry May claimed to have made "the perfect robot". Alpha the robot could talk, sing, laugh, tell the time and date, fire a revolver and whistle (but only for half an hour). Perfect. Move over David Hasselhoff. these ladies have found a real man to take for a dip in ocean. 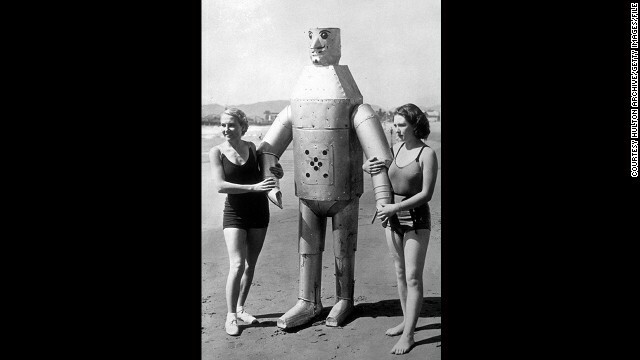 Well, perhaps not, but at 250 pounds, 7.5 feet tall and with a steely look in his eyes, Mac the Mechanical Man had a certain allure on Venice Beach back in the 1930s. What the picture doesn't show is his inventor Leighton Hilbert, who, just a few meters away is fiddling with Mac's remote controls. Way to cramp his style, Hilbert. Look we've all got our vices ok? Even tin men. 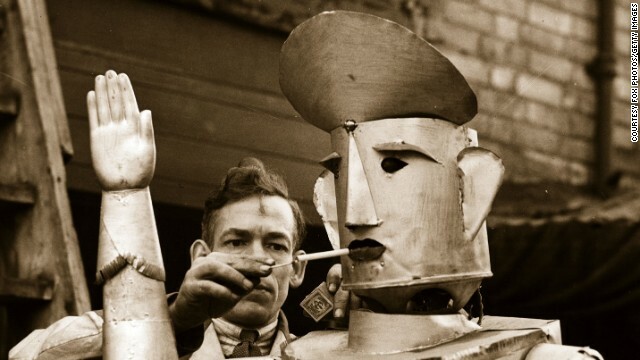 The most pointless function for any robot ever, devised purely as a means to resemble man, electrical engineer Charles Lawson built a robot that could smoke. You have to feel for the robot -- a coerced addict. Shame on you Mr Lawson. So, they can walk the walk and talk the talk but can they actually think, wondered computer scientist Alan Turing. In 1950 he devised the Turing Test: a test to determine whether a robot can display intelligent behavior indistinguishable from a human. The idea is simple -- a person communicates with a human and a machine through a wall and if they can't tell who's responding, the machine passes. But who cares if they're big thinkers anyway? As long as they can perform simple tasks like washing the car and the kitchen, feeding the cat, and cooking dinner. Or picking up the kids from school, paying the bills, ANY OF THE ABOVE? What are robots good for anyway? Ah yes, they make fabulous traffic wardens. 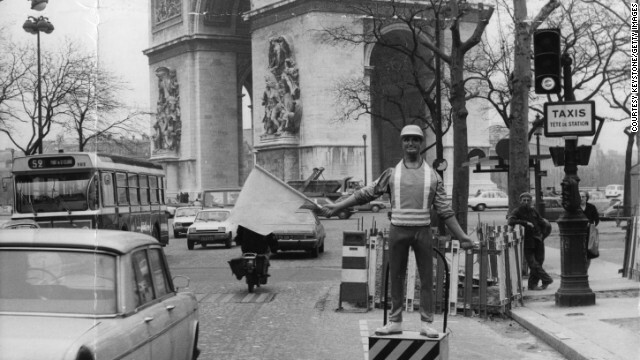 Mr Sam here was tried out by French road authorities near the Arc de Triomphe in the Seventies, to warn motorists of approaching roadworks. His job was effectively just to hold a flag up for a very, very long time. Mr Sam the traffic warden may be unwavering in his mood, despite having one of the world's most monotonous jobs, but by the Nineties Japanese professor Yoshiyuki Miwa decided robots should have the right to let us know when they're a little bit peeved. 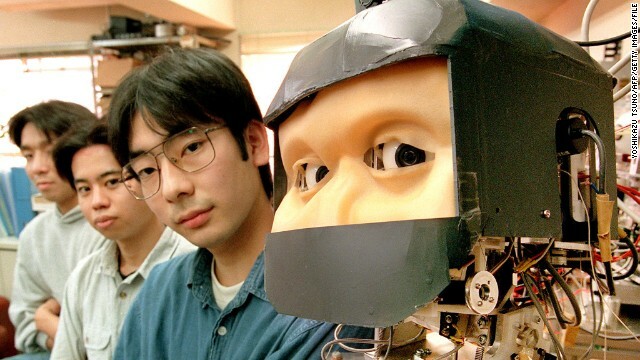 He developed the Eye Robot which has the ability to express emotions through its eyes such as joy, sadness, anger and embarrassment. OK so we seem to like making robots look like humans. But this guy had to take it one step further and build a mechanical version of himself, complete with imitation mannerisms and facial expressions. 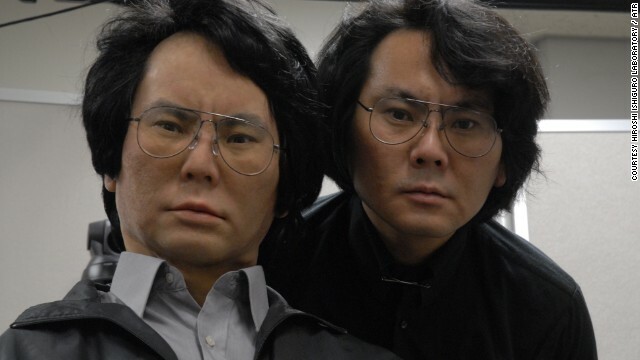 Hiroshi Ishiguro is the director of Japan's Intelligent Robotics Laboratory, who developed the first "actroid," a humanoid robot with features and functions almost indistinguishable from a human's. Austin Powers thought he had found his perfect woman, until bullets starting firing at him from her brassiere. 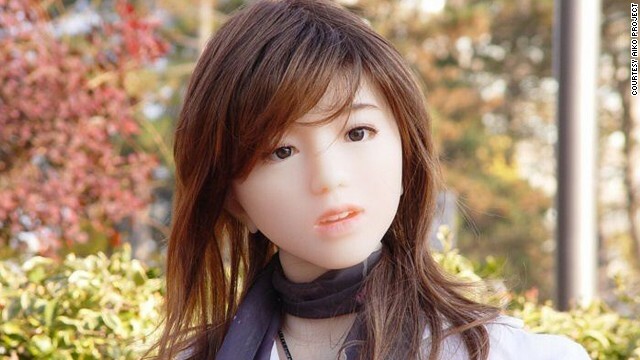 Here's hoping Le Trung's Aiko fembot doesn't come with such a severe drawback, especially considering the inventor spent his entire life's savings plus a few credit card loans to make her. Aiko, Japanese for "beloved one", can make tea and coffee, tell the weather, read a magazine and is the first android to react to physical stimuli and mimic pain. Swoon! What a stud. Biceps, kissable lips ... what more could a girl want? 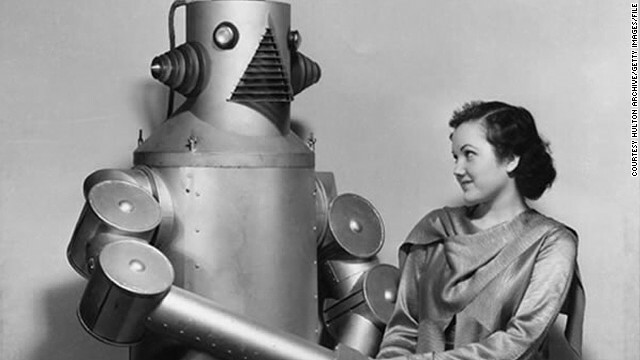 2011 was the year that human-robot love became a genuine area of research. But what would happen if the attraction between the robot and human wasn't mutual. A lonely robot hearts column perhaps? 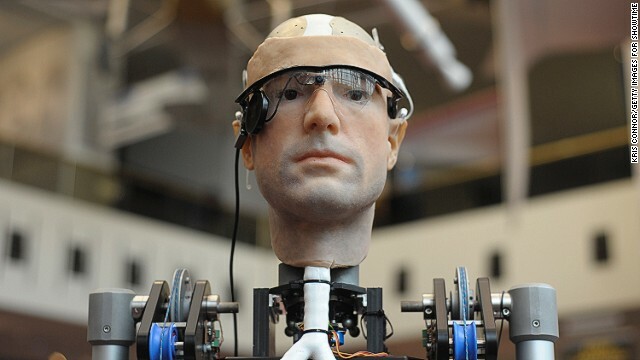 Certainly Business Insider's 13 sexiest robots ever made won't have to worry. Last month it was a dark day for robotics as the world's media reported the first "robot suicide". A family came home to find the remains of their cleaning bot the Irobot Roomba 760 in the kitchen. The robot had been switched off before they left the house, but had reactivated itself and moved along the kitchen surface to the hotplate, where it began to melt and then burn, leaving just a small pile of ashes. Mocking reporters suggested that a life that only consisted of chores was no life at all. You really can't blame him. Editor's note: John Bare is vice president of the Arthur M. Blank Family Foundation and executive-in-residence at Georgia Tech's Institute for Leadership and Entrepreneurship. The opinions expressed in this commentary are solely those of the author. (CNN) -- When a Phoenix teacher, way back in 2004, offered four students the option of learning marine science through textbook lessons or by building an underwater robot, the students chose the hands-on approach. It was a decision that revealed the power of experiential learning and created the opening scene for a Hollywood script. "I had nothing to do. I felt like a loser," one of the students, Lorenzo Santillan, told an Arizona newspaper in 2008. Without the robot club, "I would have probably just dropped out of high school." In fact, all four students graduated from high school. "All these kids have taken what they've learned and decided that they can be leaders in their community," the robotics teacher, Fredi Lajvardi, says in a new documentary film, Underwater Dreams. The film tracks four Hispanic students who started the robotics team at Carl Hayden High School in Phoenix, a decade ago. Working under gifted teachers, the guys build an underwater robot, nicknamed Stinky. The fun starts when they enter a national competition that pits their machine against robots from both high school and college teams. Teacher Fredi Lajvardi, with, from left, students Diserea Sanders, Sergio Corral , Martin Carranza, and Isela Martinez , and robot nicknamed "Stinky"
No need to spoil the finish. It's enough to say that the tale, with a tampon prominent in the construction of the robot, inspired a long-form piece in WIRED magazine, a new Hollywood feature starring George Lopez and Marisa Tomei, and the documentary film. As part of a deal with NBCUniversal and AMC Theatres, "Underwater Dreams" opens Friday, July 11, in Los Angles and New York, before rolling out to other cities. Underwriters include the Bezos Family Foundation, The Laurie M. Tisch Illumination Fund and the Virginia Piper Charitable Trust. While "Underwater Dreams" is a compelling tale about four kids who beat the odds, it carries a larger message about education reform. The need for reform is straightforward. In this century, economic growth depends on jobs for which Americans are not sufficiently trained, at least as compared to other countries. Absent reform, according to the The Jobs Council, U.S. firms will struggle to fill positions that require technical skill. How to implement reform is the sticky part. Reforming education means altering how teachers teach. When I took algebra, chemistry and physics, my teachers stood at the front of the classroom and lectured. If I learned anything, I learned by listening. Today, there is a belief that students learn more by doing. Sounds simple enough, but it's a challenge to reorganize instructional budgets, train new teachers, retrain veteran teachers and bring students and parents along. Instruction ends up looking different than your father's science class, as evidenced by the robotics poetry class offered at one innovative Pennsylvania middle school. "Underwater Dreams" adds weight to the argument in favor of hands-on, experiential learning by proving that it can be accomplished in a tough setting, without lots of new resources. The lesson is especially critical for STEM education -- science, technology, engineering and mathematics -- where we must set learning on fire for children who may otherwise disengage from school. I first heard about the Hayden robotics program shortly after the now-famous underwater competition, when the foundation where I work began making grants to support programs at the school. The students saw they could accomplish more than they ever could have imagined. Whether they went on to become an Army paratrooper like Oscar Vazquez or a chef, as Santillan has done, their high school experience helped. "With robotics, the kids fell in love with building, pure and simple," "Underwater Dreams" filmmaker Mary Mazzio told me in an e-mail. "They loved the kinesthetic learning of how things worked. Although they didn't call it engineering, that is what they fell in love with. Oscar first learned to make a catapult for Halloween -- and they concocted a giant catapult right out of Joan of Arc -- and had pumpkins smashing everywhere. He fell in love." From the film, I was struck by Dean Kamen's remarks on the need to develop talented young people. An inventor whose creations include the Segway, Kamen is also founder of FIRST robotics, which enables more than 350,000 students to build robots annually. I called Kamen to ask him whether the kids in "Underwater Dreams" represent a fluke, or whether all students could flourish this way. "You didn't find two needles in the haystack," Kamen said. "You found a stack of needles. They are all sharp. All they needed was a little guidance, a little support." Let's hope the release of "Underwater Dreams" leads to more schools uncovering more of these needles.